or why I long for its embrace. That leaving gets more difficult with time. And yet, I’m always faithful to the road. I’d miss the road, and I would want to go. I actually wrote that poem a long time ago, when I traveled a huge amount for business. But it still applies — and so I’m off again. Tomorrow morning, I’m leaving for Egypt, then I’ll head to Jordan. So there won’t be any posts for a few weeks. But there will be adventure. And to tie this trip to Australia, I give you camels. 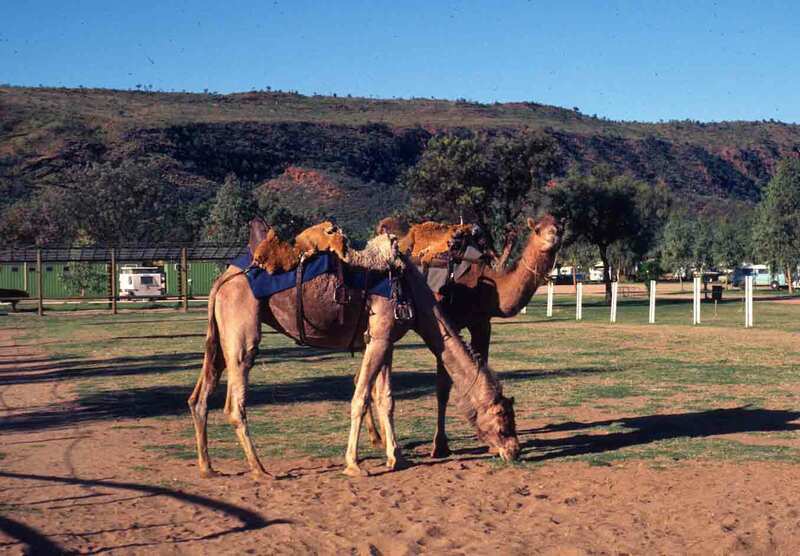 The one-humped dromedary was introduced into Australia as an ideal beast of burden for crossing Australia’s deserts. Today, thoroughbred camels are exported from Australia to the Middle East. The camels below are at a camel farm just south of Alice Springs. Before I carry the narrative beyond the Northern Territory, I thought I’d take a moment to reflect on what the statistics for this blog are telling me. Interestingly, what they’ve told me is that eucalyptus trees are of stunning interest—particularly ghost gums. Every day, the top post people are looking at is the one I did one year ago about eucalyptus trees (eucalypts in general, but with a special nod to, and photo of, the lovely ghost gum). Of those who reach that post, more than half have actually searched for ghost gums. Others have just looked for gum trees, Australian gums, eucalypts, Australian eucalyptus trees, or blue gums. Posts I’ve done on other trees—boabs, screw palms, and paperbarks—get some play, but nothing like the eucalypts. With more than 100 posts on the site, “Ghost Gums” still gets about 1 out of every 8 hits. Anzac biscuits are in second place, but have gotten less than a quarter of the hits the post on eucalyptus trees has received. Anzac biscuits was an early post, too (March 23, 2007). Of more recent posts, termites and water buffalo seem to be gaining ground pretty quickly. Of course, that simply reflects searches. Once people get to the site, parrots, waterfalls, rainforest, kangaroos, and other delights keep them around. But there are a lot of folks interested in gum trees. 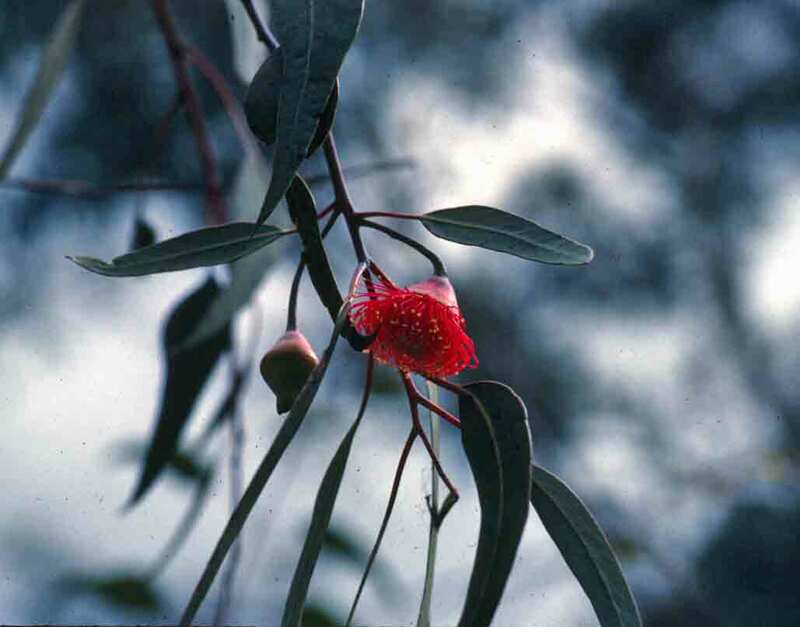 The gum flower below is red, but for different species, can be pink, white, or yellow, and can range from tiny to fairly impressive. The other photo shows one of the things I love about the many eucalypts that shed their bark, what I call the Impressionist Effect. 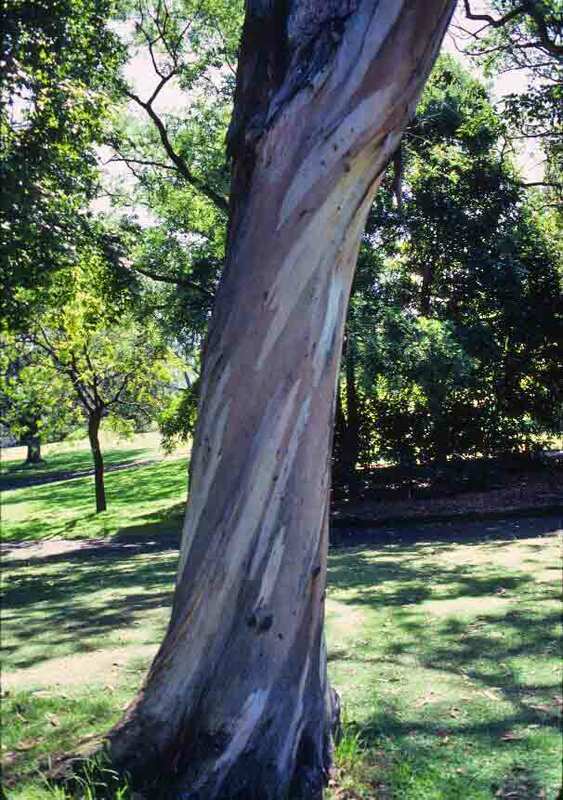 The bark comes off in long strips, and the fresher vs. older places where bark has come off give the trunk the look of an impressionist painting. Depending on the type of tree, the freshness of the lost bark, and the weather, there can be more colors than this—a greater range of tans and browns, plus greens and even rust color. This effect never failed to delight me. My last day in the Northern Territory was a long one, but splendid. It started with an all-day climb/swim/boat up Katherine Gorge and ended with boarding a bus after midnight and heading for Western Australia. Katherine Gorge, also known as Nitmiluk, is owned by the Jawoyn people, the same people whose corroboree I’d had the pleasure of attending the night before. Our guide for what would be an adventurous nine-hour excursion had been the narrator during the story dances at the corroboree. 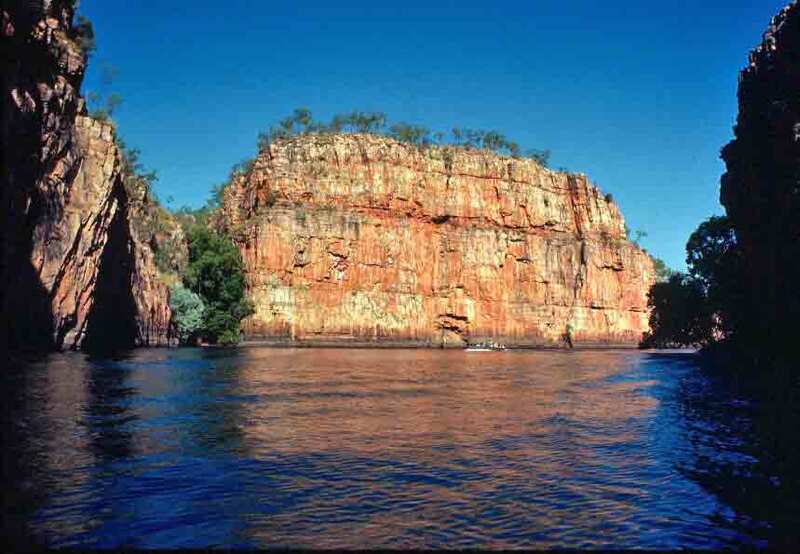 Because the Katherine River followed fault lines as it carved down through the sandstone escarpment, the gorge is actually divided into 13 sections, each of which is generally referred to as a numerical gorge — first gorge, second gorge, etc. Most folks only make it through the first two gorges, because not everyone wants to spend nine hours hiking over wildly fractured rock in 100 degree heat. But for those who have the time and energy, the gorge repays one with increasingly glorious scenery. I will admit that in looking back at my photos, I’m amazed that I made it over some of the rock barriers in the gorge, especially in light of the fact that I was carrying most of my camera equipment with me. The photos below are of the splendid red wall of Jedda Rock in the second gorge, and of the wild and weirdly worn rocks we had to clamber over to get to the sixth gorge. The rocks are, I think, self-explanatory—it was a difficult scramble. But Jedda Rock is more than just a lovely bit of scenery on the river. Jedda, made in the 1950s, was the first movie to feature Aborigines in leading roles and to attempt to explore cultural differences (though pretty much just from a colonial perspective). The climactic scene of the movie involved the heroine, Jedda, plunging to her death off of this rock. Here, you can see some still images and a brief clip from the movie. Much of the movie was filmed in this area, but the story about filming gets hazy here. Some say the fatal fall was filmed from this rock but was later reshot in New South Wales. Others suggest that, as the fall would be too dangerous, New South Wales was the only place the fall was filmed. Either way, the actors started out on top of this rock—and you can recognize the terrain of the gorge in the film stills. 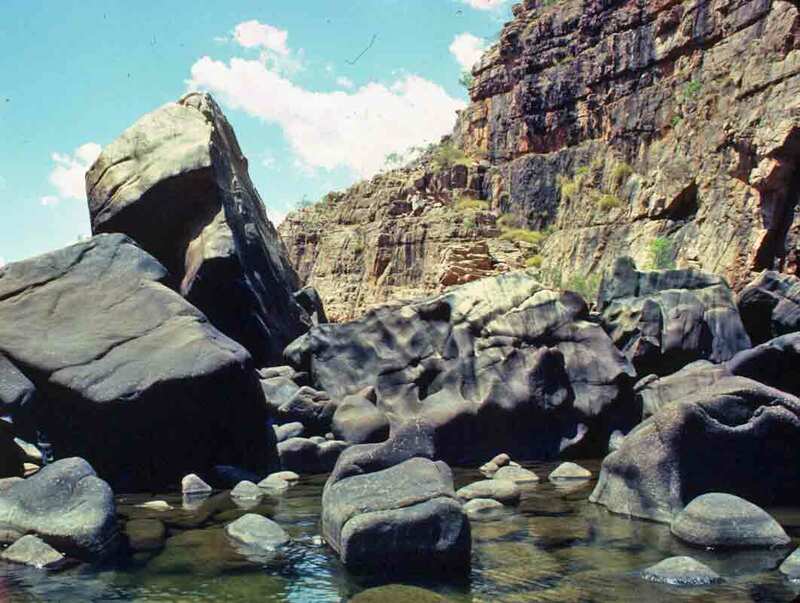 And Jedda Rock is a good example of the beauty enjoyed during a cruise of Katherine/Nitmiluk Gorge. Not far from the thermal pool is the site of the old Elsey Station, a sprawling cattle station carved out of the wilderness. This was the home of Jeannie and Aeneas Gunn at the beginning of the 20th century. It was at that time an incredibly remote location, and Jeannie Gunn was in fact the first white woman to reach the area. 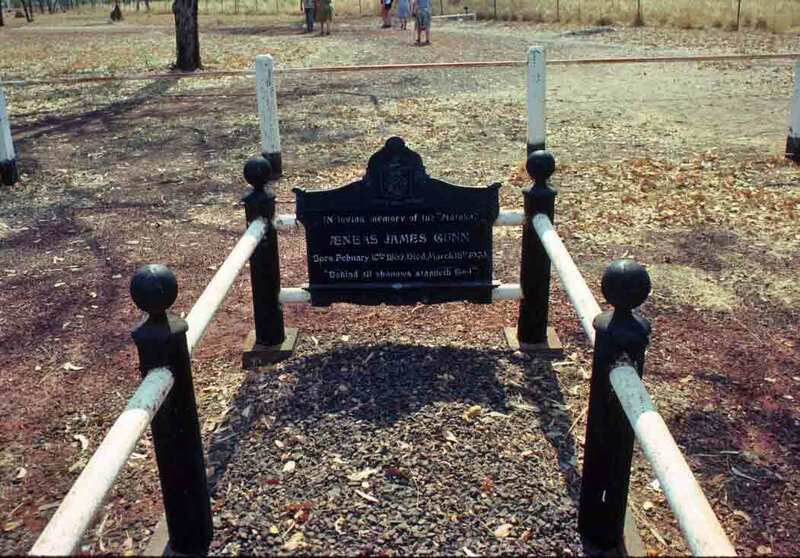 Jeannie Gunn, who is actually more widely known as Mrs. Aeneas Gunn, as that is the name under which she published, kept diaries of life among the men and Aborigines who occupied the region. She eventually turned her writings about the hard but happy life on the edge of nowhere into the book We of the Never-Never, now considered one of the classics of Australian literature. And it’s a great read. We of the Never-Never has also been made into a wonderful movie. If you have not read the book or seen the movie, I recommend both highly. At Elsey, I saw the graves of many of those I knew from the book, including that of Aeneas Gunn (shown below), who died far too young.